When you're applying for your first occupational therapy position, you're going to want your resume to sell you. That piece of paper needs to showcase your finest fieldwork moments and highlight your strongest attributes. Part of the art of creating a strong occupational therapy resume lies in your selection of powerful words. Most of the information in your resume is going to be a discussion about your fieldwork or work experience, but the way that information is presented can dramatically affect the way you are viewed by the facility. 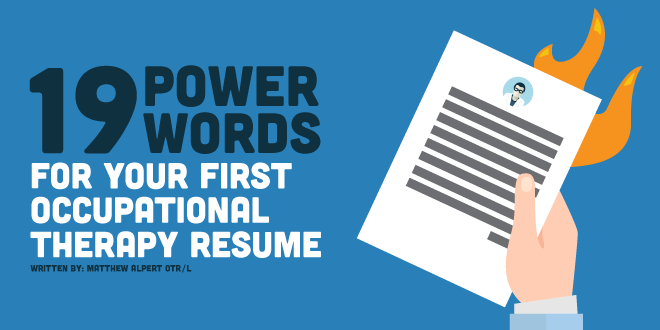 By using powerful words and ensuring consistency throughout your resume, you will come across as a polished, expert communicator. You will be somebody the facility is psyched to interview! When your resume is being reviewed, you want your experience and knowledge to stick out. The ability to express your skill set on a piece of paper will clue your interviewers into your communication skills. As we all know, good communication is at the heart of occupational therapy. Characteristics from an individual's personality are difficult to convey verbally, let alone in a resume. It is even more difficult when these personality traits are for a focused profession, such as occupational therapy. When constructing your resume it's good to look at some employment postings for ideas as to the characteristics employers are looking for a perspective practitioner. It's also wise to refer to the mission statement of potential employers for characteristics of the facility itself. This is a particularly helpful if a facility is geared toward client care and satisfaction. Now that you have a general understanding of occupational therapy resume terminology, it is time to put that knowledge to use. There are several ways of implementing hard skills; however, the main way is with consistency. When describing how evaluations or assessments were being administered, be consistent with the language used. Now that your hard terms are dialed in, let's take a quick look at your soft terms. These can be used within your personal mission statement or within the description of your work experience as well. At New Grad Occupational Therapy we are here to help you as much as possible. We use our experience to help others just as we want to help our clients.